On this page, we show you how to use a partition magic software to expand the size of C drive on Windows SBS 2003. Download IM-Magic Partition Resizer Server to extend C drive on Windows SBS 2003 when receiving low disk space alert. Is it possible to extend c drive on Windows Server SBS 2003 with diskpart cmd? The truth is the cmd only works with non system partitions on Server SBS 2003 but not the boot c volume. Nor the disk management tool either works on c partition. Under such circumstances, Partition Magic Resizer Server would be your best choice for extending c drive on sbs 2003 which is 100% safe without rebooting os during the disk management. 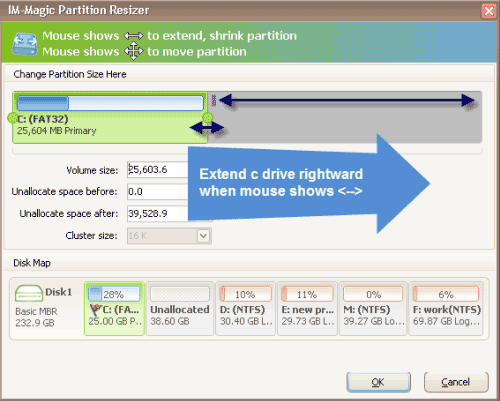 Move the arrows to shrink the selected partition so as to create some unallocated space. "My Lenovo PC with Windows SBS 2003 Operating System has low disk space issue on C drive when I start the PC. There is only 20GB total space on C drive with less than 1GB free space left now. Although it doesn't have any influence on my PC, I still want to look for a way to fix the low disk space problem on the C drive. Please tell me how to expand C drive space on Windows SBS 2003?" "Does anybody encounter the low disk space issue on SBS 2003 C drive system partition? The C drive, which also works as system partition, is running out of disk space and my computer is running more and more slowly. 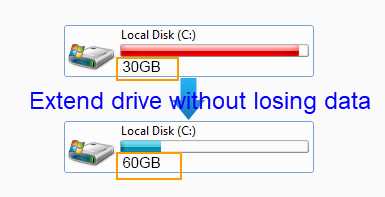 I doubt if it is possible to resize the hard disk and reallocate some free space to C drive. Well, the hard disk on my computer is SATA 120GB disk which had been divided into two partitions." It is not a difficult task to resize C drive on Windows Server OS with IM-Magic Partition Resizer Server which is able to expand C drive to fix low disk space without touching data on the partition.